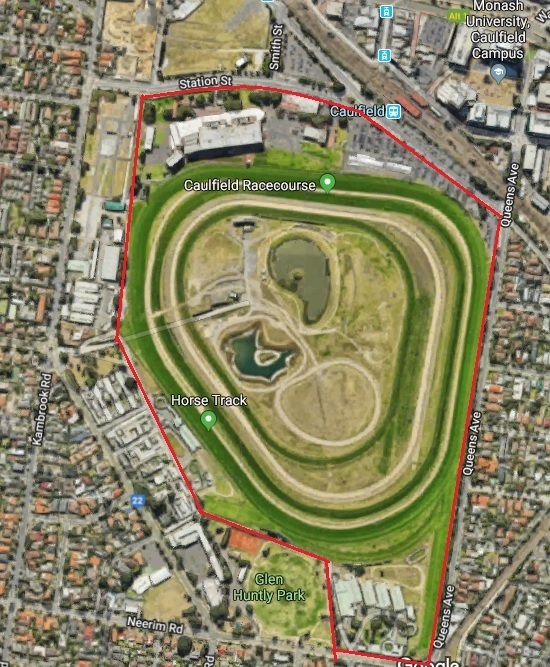 For those who don’t know in 1858 a Crown Grant established the Caulfield Racecourse and Recreation Reserve with 3 separate yet equal purposes – racecourse, public recreation ground and public park (Caveat on Title). Yet over the past 20 years lack of oversight and mismanagement (State Government and Board of Trustees) has allowed racing and racing’s commercial activities to dominate the reserve to the exclusion of the public park purposes. 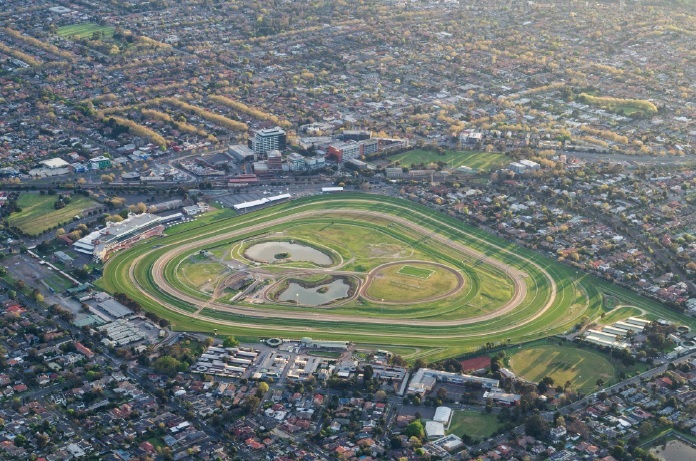 11 hectares (20%), is leased by the Melbourne Racing Club (MRC) for a flat rate of approx. $170,000 p.a. 6 hectares (11%) is open space for potential use by the community on restricted days at restricted times. Use of the racecourse parkland by the public is not actively promoted nor visible from the surrounding streets. It is also difficult to physically access and comprises limited facilities that don’t meet park users’ needs. It is now almost 2.5 years since the AG’s Report and, although “opening up” the Reserve for public use by the surrounding communities of Glen Eira and Stonnington would be significant*, only scant information is available on progress and little has been achieved at “ground zero”. 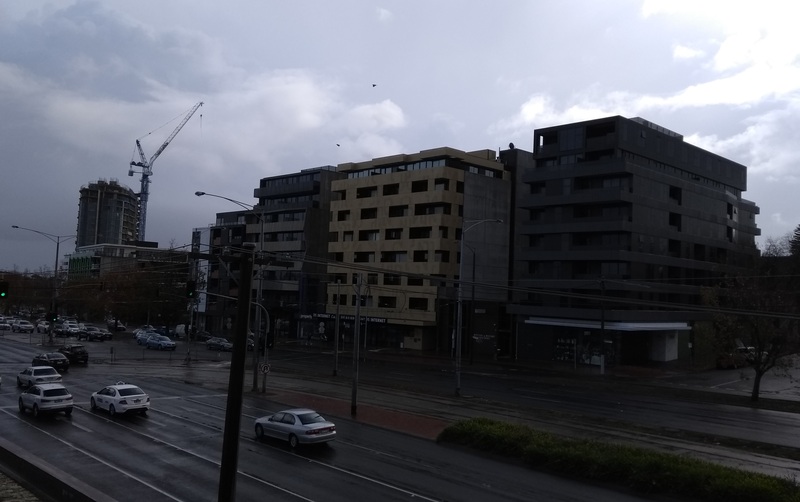 Therefore, GERA, in conjunction with the Malvern East Group (a.k.a. 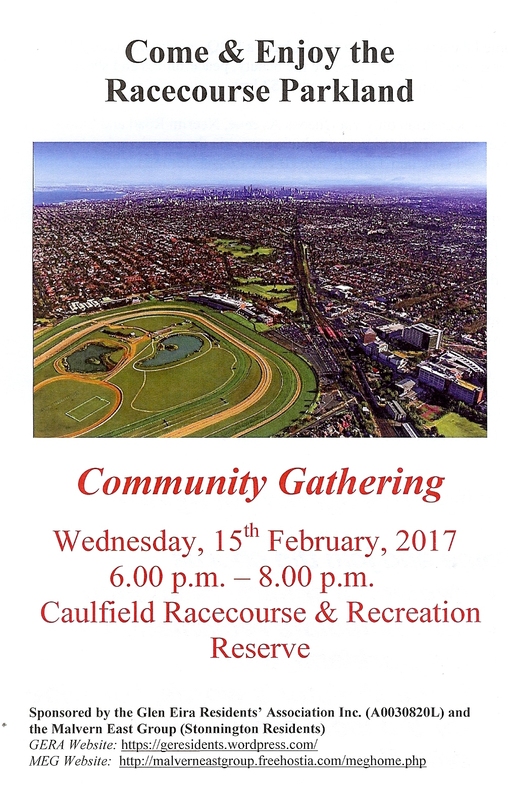 Stonnington residents group), invites you to a Community Gathering at Caulfield Racecourse between 6.00 & 8.00 pm on Wednesday, 15th February, 2015. Providing an opportunity for the community to visit the park and experience it’s magnitude and beauty. ensuring compliance with the Auditor General’s recommendation for open and transparent management this public land. just south of Dandenong Road which is the boundary between the two municipalities. Residents in both Municipalities experience adverse amenity impacts (traffic, parking and noise) from racing and racing commercial events. In both Municipalities, the residential areas surrounding this small stretch of Dandendong Road are targeted for, and are currently experiencing, high density growth. Just published in The Age – after 140 years, and almost two years after the scathing Auditor General’s Report (17/9/2014) on the Management Performance of the Caulfield Racecourse Reserve Trust, it looks like the State Government is taking the first step in ensuring this Crown Land (valued at $2bn) is governed in accordance with it’s 3 specific purposes of racecourse, public park and public recreation ground. 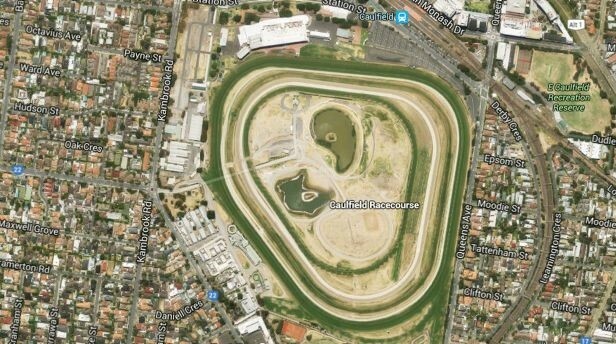 A powerful board that manages the Caulfield Racecourse faces being sacked after years of “unworkable” governance, paving the way for one of Melbourne’s best kept secrets to be opened up for greater public use. 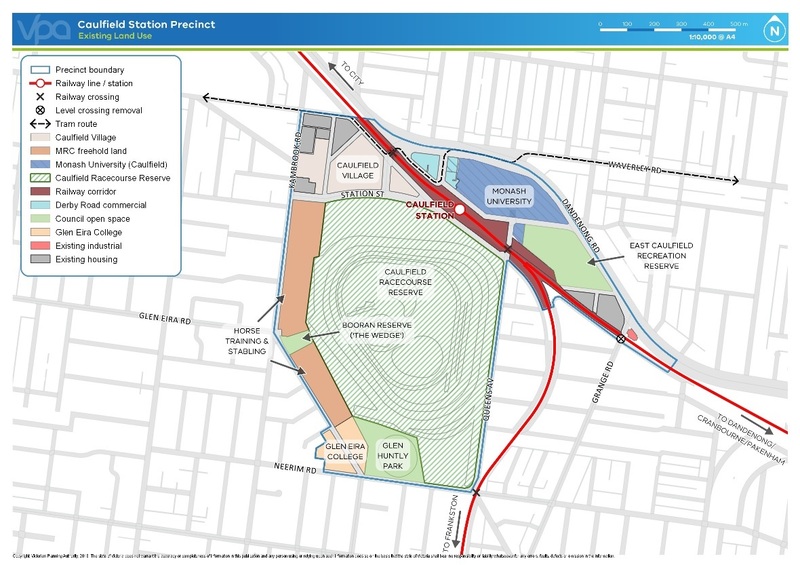 In a move likely to be welcomed by residents, the Caulfield Racecourse Reserve – the equivalent of about 15 MCGs worth of open space – could soon be utilised for more recreation, local sport and much-needed parkland in the heart of inner-city suburbia. 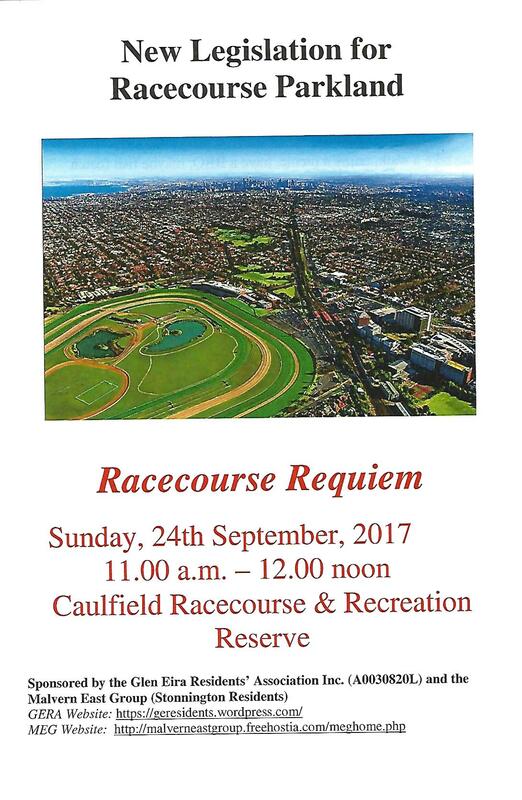 The reserve is home to premier racing events such as the Caulfield Cup and the Blue Diamond Stakes, but the land was put aside a century ago for broader community use, not just the city’s sporting elite. 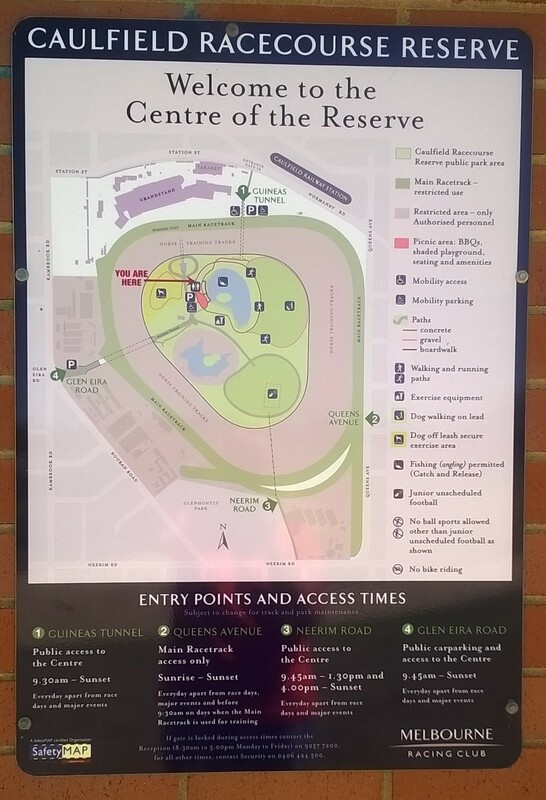 However, most Melburnians would not know they can simply walk in and use the space, largely because the governing board – made up by a secretive group of trustees heavily influenced by the powerful Melbourne Racing Club – has made the site look unwelcoming and managed the area for years to serve its own interests: predominantly training and racing. A bipartisan panel set up by the Andrews government earlier this year has now branded the trustee structure “unworkable” and “anachronistic”, and called for a new independent body to manage the reserve. The panel’s report, seen by The Sunday Age, suggests the government could first request the resignations of the trustees, whose 15 members comprise six MRC nominees (including chair Mike Symons and vice-chair Peter Le Grand); six government nominees (including former ALP national president Greg Sword and federal court judge Shane Marshall) and three from the Glen Eira Council. If the trustees don’t stand down legislation would be introduced giving the minister the power to dissolve the group and set up a new, clearer governance structure based on bodies such the Melbourne and Olympic Parks Trust or the MCG Trust. In the meantime, the department of environment would be appointed the interim land manager. Environment Minister Lily D’Ambrosio said she was considering her options and would respond shortly. 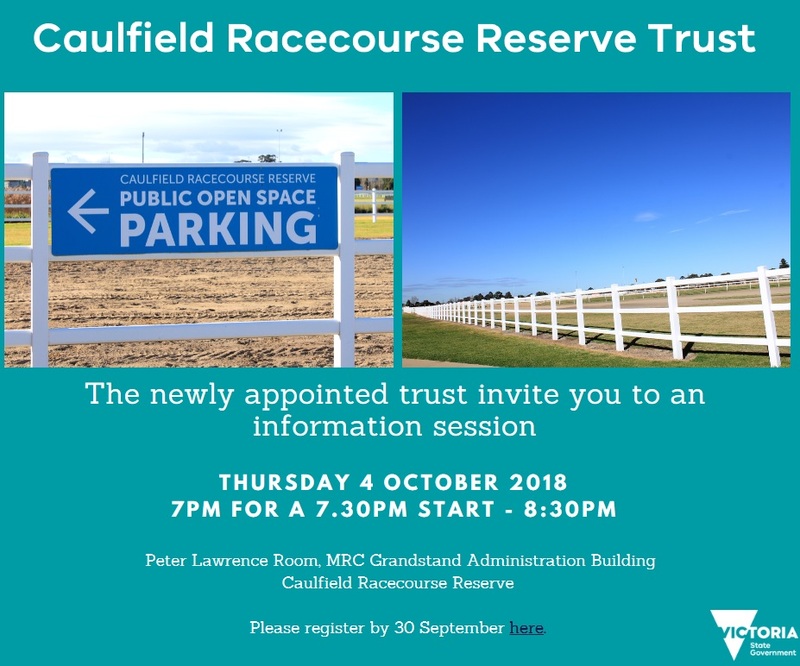 A key problem with the governance of the Caulfield Racecourse Reserve is the trust is the landlord and the Melbourne Racing Club its tenant – yet six of the 15 trustees also happen to be MRC appointments. The composition of the group has therefore resulted in perceived and real conflicts of interest, a lack of accountability, and unresolved disputes between trustees on everything from the lease arrangements to how the area should best be used. The City of Glen Eira has the least public space of any municipality, and councillors have previously pointed out there were about 400 children unable to play sport in the area last winter because they simply didn’t have the room. Mr Dimopoulos said it was crucial the MRC deliver on a plan to remove training from the site within five years, to allow sports grounds to be established around the reserve. The skewed way in which the reserve has been managed was highlighted in a 2014 Auditor-General’s report, which found 37 out of the reserve’s 54 hectares were being used by the MRC for racing and training “without clear legal entitlement or transparent arrangements in place that recognise the financial benefit to the club”. A further 11 hectares were leased to the MRC. But only six hectares were identified as space the public could use – if they managed to navigate their way past the poor signage and unwelcoming access points.